A Morpeth teenager’s classmates and teachers will be pushing themselves to the limit in aid of a fund-raising appeal set-up by a group of his friends on behalf of his family. Oliver Bultitude was diagnosed with osteosarcoma, a form of bone cancer, in August 2018. As a result of this, he is undergoing aggressive chemotherapy after having his leg amputated. Events and activities have been and are being organised to help raise money so the 17-year-old can purchase a sports prosthetic, which would help him to return to his much-loved sports. According to the Justgiving page that was launched last month – its target is £15,000 – the King Edward VI School student ‘won’t receive funding for this as he will be over 18 when he is ready for one’. Year 13 at KEVI will add to the total through a spinathon that is taking place tomorrow (Friday) from 9am to 3pm. Teachers and students will race against one another on gym exercise bikes throughout the day for Team Rory or Team Louis. 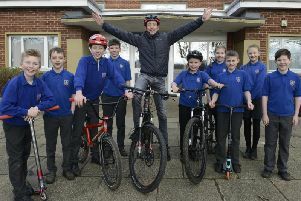 Oliver himself will cycle against head of year Emma Familton during the spinathon and there will also be other fund-raising activities throughout the day such as raffles and cake sales.